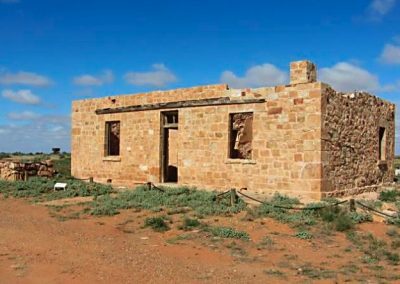 Farina is located 55 kilometres south of Marree (initially known as Hergott Springs), in the arid Far North of South Australia. The town originated because of a reliable waterhole on the bend of a normally dry creek, beside which some gum trees flourished, known as the ‘Gums Waterhole’. This was renamed ‘Government Gums’ when in about 1870 the government built a dam to support a temporary construction camp for the Overland Telegraph Line and also to provide a reliable water supply for livestock travelling into the advancing frontier of the far northern areas. Several years of good rainfall in the mid-1870s led to the belief that wheat could reliably be grown in the area, as a result of which some grain farmers with high expectations persuaded the government to establish a town at the location. The town was surveyed in 1878 and given the Latin name Farina, meaning flour. However, the return of drier years soon caused these hopes to be shattered. Farina’s subsequent growth occurred not because of farming but as a result of the construction of the Great Northern railway line from Port Augusta to Government Gums and later extended on to Hergott Springs (Marree), Oodnadatta and finally Alice Springs. In May, 1882 the railway reached Farina, which rapidly became an important railhead for the transportation of livestock, wool and goods from as far away as Innamincka and Western Queensland. Following the establishment of railway workshops the town population rose to about 300 by the mid 1880’s. 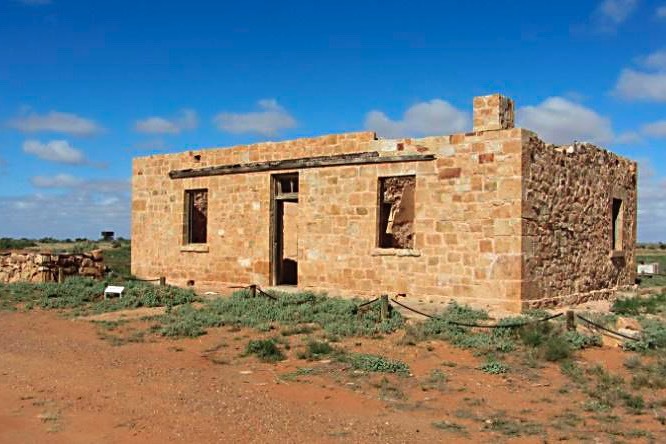 Prior to April 1875 there had been calls for a police trooper to be based at Government Gums, as drovers and cameleers worked northwards from Farina to the Birdsville and Oodnadatta Tracks and north east on the Strzelecki Track to New South Wales and Queensland. By June 1876 (exact date not known) the first police trooper was stationed at Farina; Mounted Constable Frederick Campbell set up a police station in a small tent on a rocky rise in the vicinity of what is known in 2016 as the Farina Station camping grounds. Issued with three police horses and with a post and chain as a police lock-up, the police station was attached to the Far Northern Division. On 15th May, 1877 Mounted Constable John Bannigan transferred from Blinman to take charge of the station, which by the early 1880’s had been moved from a tent to rented premises constructed of vertical wooden palings, believed to be owned by former police trooper Samuel Gason. Coinciding with this, in June 1880 an order was placed for a portable police cell for Farina. Police duty was not just confined to Farina and in 1884, Mounted Constables John Opie and John Lynch were required to search for two wanted men who were making their way to Queensland. After having quickly travelled over 300 miles (483 kilometres) up the Diamantina in just eight days, their horses having died of exhaustion, the constables walked the remaining 40 kilometres into Birdsville where they located and arrested the two men. However, because of drought, the constables could not return. The track which they had just traversed was now impassable and the constables were obliged to remain at Birdsville for a month. Eventually Mounted Constable Opie was able to hire a pack camel to assist in conveying his prisoners back to Farina. The return journey took three weeks, walking beside the pack camel. Each night when Opie retired he handcuffed a prisoner on each side of him. The prisoners were eventually safely delivered to Adelaide. In 1884 the first of two significant tragedies struck the Farina police station. On Saturday 28 June 1884 Mounted Constables Richard Spicer and Peter Browne, both stationed at Farina, were engaged in mounted firearm target practice with Mounted Constable Bannigan and Aboriginal Police Tracker Tommy in an area known as ‘The Butts’, about one kilometre from Farina. The police horse on which Mounted Constable Browne was seated suddenly swerved around, resulting in Browne accidently discharging his police issue Smith and Wesson revolver, shooting Spicer in the neck. Critically injured, Spicer was conveyed back to Farina, where help was sought by urgent telegrams. Spicer was nursed by local ladies pending the arrival of Doctor Powell from Hergott Springs, who hurried to Farina by means of a railway tricycle. A special steam train was rushed from Port Augusta to collect the fatally injured constable and convey him to the Port Augusta hospital. Sadly, shortly after arriving at Port Augusta on Sunday afternoon, Mounted Constable Spicer died, aged 34 years, on 29 June 1884. 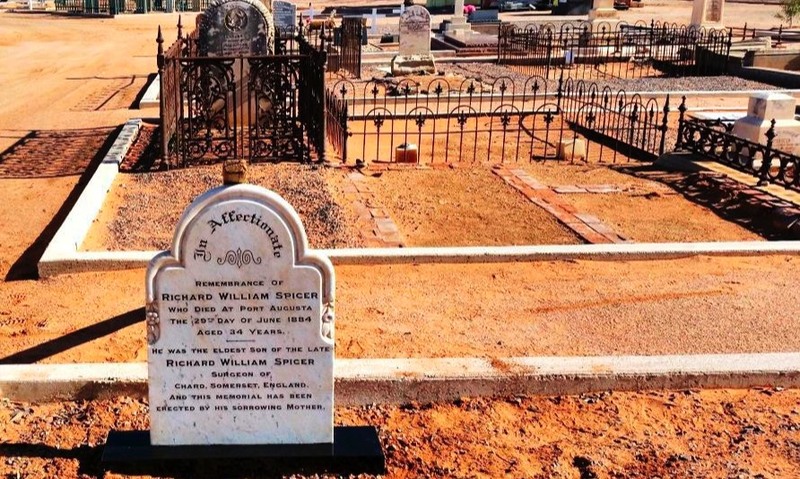 He was buried in the Port Augusta Cemetery where a marble headstone (illustrated) was erected by his sorrowing mother. Two years after the railway reached Government Gums (Farina) in 1882, the line was extended to Hergott Springs (Marree) which in 1884 became the Great Northern Railway railhead, resulting in the start of the decline of Farina as a thriving township. Nevertheless, Farina continued to be staffed by a corporal and two mounted constables, issued with a complement of police horses and camels. 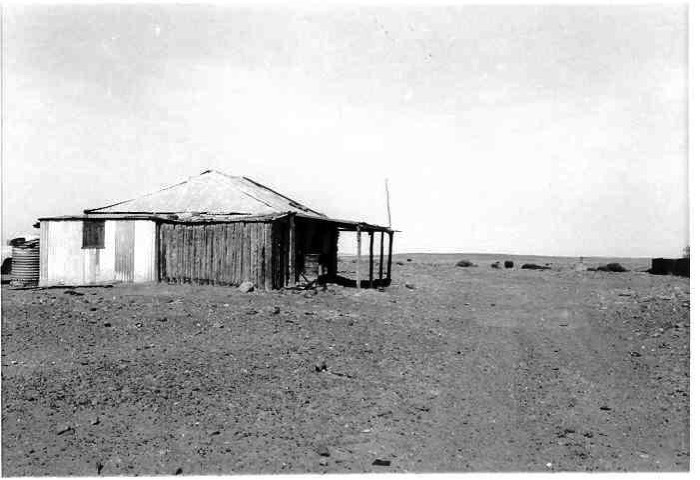 In June, 1888 when the lease of the police station was due to expire, Inspector Besley at Port Augusta, wrote to Police Commissioner Peterswald recommending the renewal of the lease, saying; “Farina is a station that must be kept as it is our Depot for camels and the key to the Innamincka Track over which there is an immense traffic to N.S.Wales and Queensland.” The lease was renewed but during 1890’s a two bedroom house constructed of stone with a galvanised iron roof had been purchased for use as the police station. It was located on North Terrace, Farina (in the vicinity the cricket ground). The wood and galvanised iron single police cell was relocated from the former rented police premises to the new station and placed adjacent to the rear stables/shed. The role of the police at Farina during this period was not only to maintain law order and carry out patrols of the far north and surrounding cattle stations but also included carrying out a myriad of other government services which for Mounted Constable James Dowling in 1892, included the role of ‘public vaccinator’. 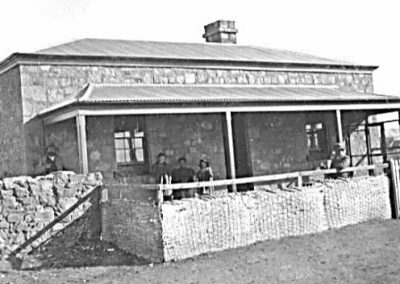 In 1892 the Port Augusta Dispatch, Newcastle and Flinders Chronicle newspaper reported, “Mr Dowling, the officer in charge of police here has vaccinated a goodly number, judging from the women and children seen going to and from the police station.” By the early 1900’s with the decline in population and the establishment of other police stations within the far north of the state, Farina was reduced to a one officer station. It was during this period that the second significant tragedy occurred at the Farina police station. In June 1903, the death took place of a six month old baby girl of Mounted Constable William Neil Smith and his wife Mrs Flo Smith. At the time of the infant’s death, Mounted Constable Smith was absent from the police station for an extended period, conducting a search for a missing prospector. During the search Mounted Constable Smith received word that one of his children had died, however it was some time before he could return to find out the identity of which of his children had passed away. The life of Mounted Constable Smith is quite sad. His first wife died of typhoid fever whilst he was stationed at Gladstone. After re-marrying, a six month old baby also died at Gladstone, followed by a second child at Farina and finally in early 1916, whilst stationed as the officer in charge, Kingscote police station, Mounted Constable Smith died of appendicitis. By the late 1920’s the role of the police horse and camel were in decline, the officer in charge of the police station being permitted to use his private motor vehicle for police transport, for which mileage was reimbursed by the Police Department. It was also during this period that a number of improvements and repairs were carried out on the police station, some repairs being due to a major storm in November 1921, which caused substantial damage to the town. 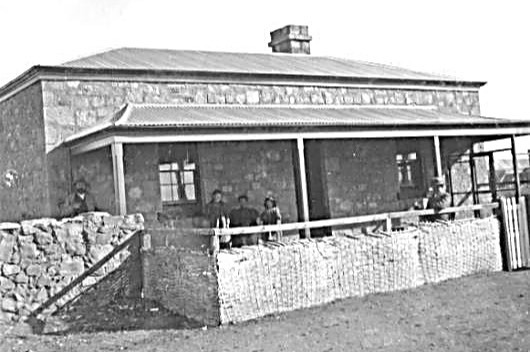 The station building works included removing sand from the ceilings, installing a new bathroom and cement floor, replacing the front verandah posts, providing a hood over the external door entrance to the police office, replacing the existing ceilings with new fibrous plaster ceilings in the two bedrooms, living room and kitchen and replacement of the external residential water closet (toilet). 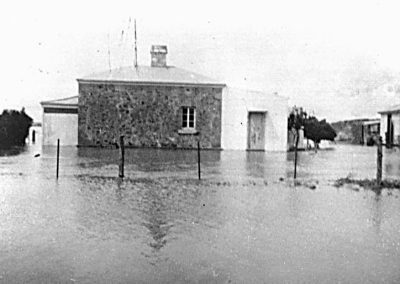 In March, 1950 Farina suffered its worst flood in 50 years with the flooding of the Witchelina Creek. 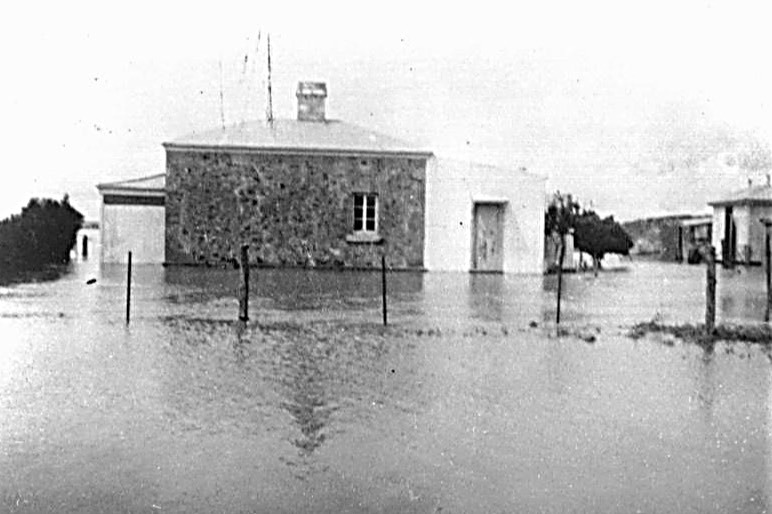 This resulted in the police station being inundated with water up to four feet deep and three feet of water in the station yard. The then officer in charge, Mounted Constable W.R. Geary in a report to his Inspector wrote, “Police Station is finished, bad odour, damage to foundations and floor boards buckled.” By June 1950 it was suggested that the police station should be rebuilt on a higher section of the town, but with the recent establishment of the township of Leigh Creek and the opening of a police station there, coupled with the continued decline in Farina’s population, the Farina police station was closed on 18 January, 1951 and the wood and galvanised iron police cell dismantled and relocated to Kingoonya police station. 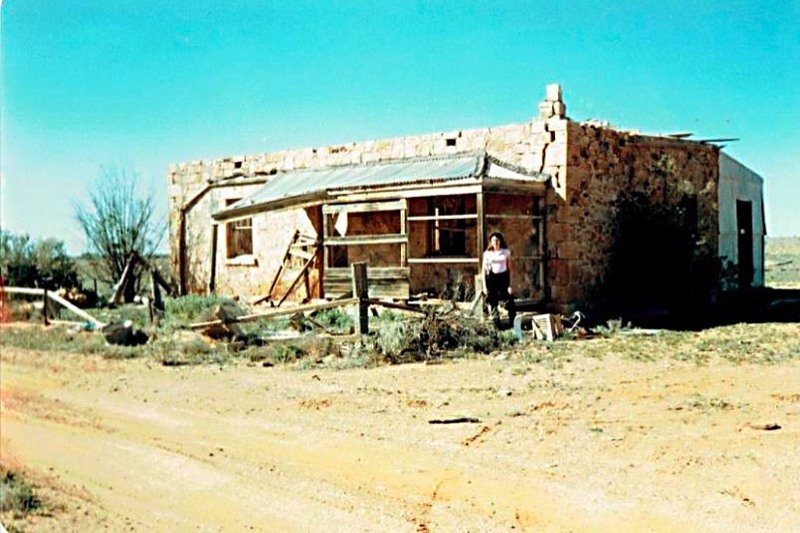 The Farina police district was subsequently divided and allocated to Maree and Leigh Creek police stations. Within a few short years Farina became a ghost town of vacant and crumbling buildings. In 2008 there was good news for the historic former township when the Farina Restoration Group of volunteers was formed and work commenced on preserving many of the building ruins, including restoring the unique old underground bakery and the two former police stations. In 2017 Farina is now a popular camping location and historic tourist attraction with the excellent work of the Farina Restoration Group continuing into 2017 and beyond. 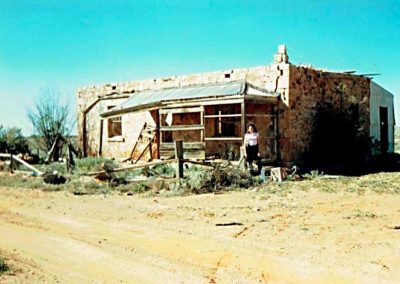 Postscipt: There remains uncertainty by some historians as to the year that police were first stationed at Farina and how many structures were occupied as the Farina police station. It is the author’s view based on all available evidence that Mounted Constable Frederick Campbell was the first to be stationed there in June, 1876 and that there have been three police stations; the first located in a tent, the second in rented premises near the present day restored underground bakery and the third at North Terrace.